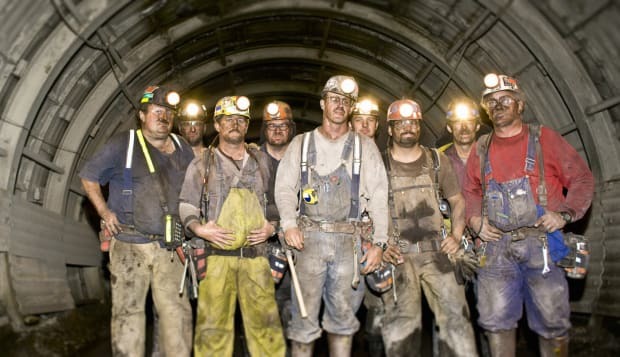 Getty ImagesCoal miners: more awkward than you'd think? Not everyone is a people person, so we wanted to find the best jobs for people who prefer to avoid frequent communication. To rank these jobs, we used data from O*NET Online, a U.S. Department of Labor database with information on hundreds of jobs. O*NET gives scores between zero and 100 to occupations for a range of characteristics, based on surveys of employees in those jobs and input from professional job analysts. We took O*NET's measures of the importance of four communication skills: communicating with people inside the organization, communicating with people outside the organization, writing, and public speaking, and averaged together the scores for each job. Jobs were ranked better if that average score was lower. We also factored in the 2013 median annual earnings for each job from the Bureau of Labor Statistics' National Occupational Employment and Wage Estimates. By combining the earnings rank and communication scores, we were able to identify high-paying jobs that don't require a lot of communication. Why they're on the list: Locomotive engineers have very little need for communicating with people outside their organizations, and basically zero public speaking duties. Why they're on the list: While communicating with coworkers is somewhat important for roof bolters, they have almost no contact with people outside the mine, and a below average amount of writing required in the job. Why they're on the list: As with many of these jobs, communication with the organization is somewhat important. Much software development is done in teams, and keeping members of the team coordinated is crucial to many projects. However, public speaking is unimportant for app developers, and writing and communicating with people outside the organization is not typically emphasized. Why they're on the list: O*Net's data indicates that public speaking is less important in this job than in almost any other. The job also received low rankings in external communication and writing. Again, internal communication does have some importance in this job, although less than in other careers. Why they're on the list: Very few of the communications skills we considered are needed in this position. Writing in particular is much less important in this job than in most other occupations. Why they're on the list: While writing is a bit more important for podiatrists than for many of the other jobs in this list, communication with people within the organization is less important than in most careers. Why they're on the list: While communication skills in general are more important for dermatologists than for most of the other jobs on this list, they are much less important than in other jobs in this pay range. Why they're on the list: As with the other mining occupations, there is very little emphasis in this job on writing, public speaking, and communicating with people outside the company. Why they're on the list: The high median salary and minimal emphasis on public speaking combine to make this job appealing for people who are bad at this communication skill. Why they're on the list: This job places a very low emphasis on all four of the communications skills we analyzed, including communication with others within the organization. Why they're on the list: Like the other medical positions on this list, optometrists aren't required to excel in communications to the same degree as other positions with similarly high salaries. Why they're on the list: While internal communication is important, talking to people outside the organization, public speaking, and writing are not as necessary in this job as in other high-paying careers. Why they're on the list: Dentists have very high pay with minimal public speaking and writing skills required. Why they're on the list: Database administrators, by the nature of their job, are largely focused in-house, making communication with outsiders and public speaking unimportant to their work. Why they're on the list: Similar to database administrators, public speaking and communication with outsiders is not typically important for these developers.